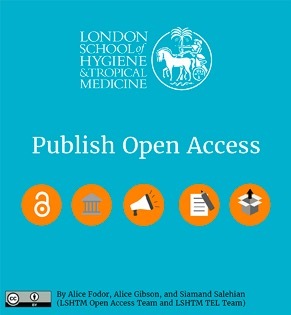 To help authors increase the reach of their research, the Open Access Team and Technology Enhanced Learning Team at London School of Hygiene and Tropical Medicine have made the Publish Open Access tool. With this, we wanted to provide a self-guided, interactive, route builder aimed towards authors in a variety of circumstances wanting to familiarise themselves with the practical steps they could take that would result in their work being published open access. By publishing open access, one makes a version of their work legally available for free to anyone to access and read online. The tool will build authors’ confidence in ensuring their work fulfils HEFCE’s requirement for research to be made open access (which ensures that work will be eligible for submission to the Research Excellence Framework), and know what funders of their work require, and how to ensure necessary measures are taken. On Research Online - http://researchonline.lshtm.ac.uk/4645489/ LSHTM Research Online is our institutional repository, where lots of open access work has been archived ready to be found and used. This tool can be used by anyone who wants to familiarise themselves with the licences that funders may ask one to publish their work with – which is usually CC BY, one of the most liberal licences where work can be re-used liberally, as long as acknowledgment is given to the author. It can be used as a way to understand what databases and tools like SHERPA/RoMEO and SHERPA/FACT can do, to help you ensure, before work is submitted, that journals offer publication routes that match your funders’ open access policies, (by depositing work in Europe PMC/PubMed Central in order to comply with Wellcome Trust’s policy, for example). As users go through the tool they are introduced to a variety of resources (like SHERPA/RoMEO) which are designed and used to make checking lengths of embargos, licences, and details regarding deposit easy. These are all collated in the Resource List, to be saved for future use. For further information on the wide variety of benefits of open access see here.